“The odds of successfully surviving a direct attack on a Death Star are approximately 4,839 to 1. As such I, T-3PO, have taken the liberty of calculating the 21 best ways in which the Death Star could be eliminated. Sir, if we were to seize critical Death Star controls, such as those responsible for the disablement of the tractor beam reactor coupling, then we could neutralize the station. A small infiltration party would be best suited to this end. If we infiltrate the station, yet find critical controls too well guarded to make an advance, then by shutting down the station's main reactor we could earn the Rebel Alliance a temporary window to attack. I also believe, Sir, that by utilising 'soft power' we could attract a suitable quantity of Death Star Stormtroopers to defect, creating an insurgency that would put the station in our hands. By harnessing super laser energy and creating a critical situation, such as blocking thermal exhaust ports and thus robbing the station of its ability to expel excess heat and energy, we could cause critical system failures throughout the station. I predict that by infiltrating the station and shutting down the space station's energy field, with a minimum of three Star Destroyers one could inflict critical damage to the Death Star's superstructure to the extent that core functionality would be compromised. Sir, if we sabotage the station's main weapon's laser-focusing nexus, I have calculated that the the resultant energy blast delivered into the surrounding structure of the Death Star would cause a 99.99 per cent probability of critical system failure. The Death Star's navicomputer, if compromised, could be used to pilot the station into a nearby star or sun. I have predicted that the chances of either of these actions leading to critical system failure is 99.99 per cent. Providing one could remain close enough for long enough, Sir, then we could upgrade R2 here with a wireless interface and command him to hack into the station's computer systems. 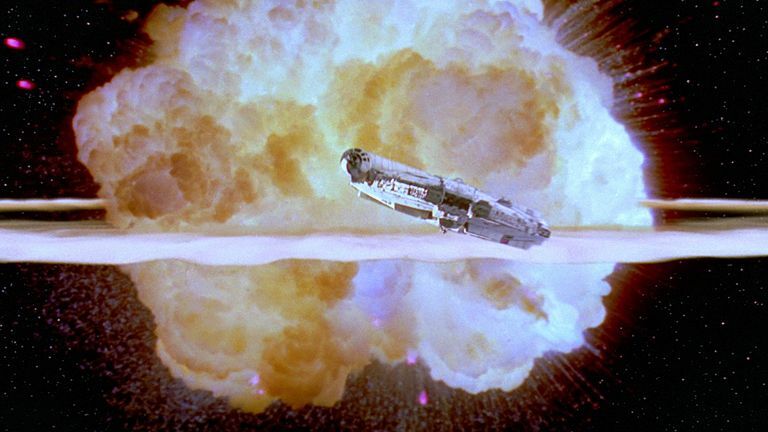 A more complicated way to crash the Death Star into a planet or star would be to sabotage its hyperdrive station. By reprogramming the Death Star's artificial gravity generators, preferably flipping the direction by 180 degrees at all points, the station would be ripped apart. If we were to corrupt the station's medical droids, turning them rogue, we could cause key members of the crew to be injured, reducing their operational effectiveness. More widespread chaos could be reaped, Sir, if we release a deadly toxin into the station's ventilation and air-conditioning system. I predict, if the toxin was class 1, the odds of a biological organism surviving the attack are 1,378 to 1. By infecting maintenance droids with a Stuxnet-style worm, we could catalyse a gradual degradation in their performance, leading to a series of unfortunate accidents and errors. One of the most straight-forward, if indirect, ways to make the Death Star vulnerable would be to disable its backup power systems. Without power, Sir, the station's operational effectiveness would drop dramatically. By reducing opportunities for communication and information flow, which could be achieved by sabotaging internal network systems, operational effectiveness would drop significantly due to the time it would take for crew members to traverse the station's vast infrastructure. A fundamental design flaw with the Death Star is its executive docking bay. By attacking only this area of the station during a VIP arrival, we could 'cut the head off the snake' so to speak. Disabling the tractor beam, Sir, would prevent the Death Star from capturing space-born objects. We could then use said objects to inflict critical damage to the station. The removal of the station's artificial atmosphere, which would be best achieved by disabling blast doors and compartmentalisation, would lead to a large number of human casualties. Sir, if we could alter the interior depressurisation rate considerably, increasing it ten fold, then we could generate a large-scale implosion, compromising the station's hull. If we could gain access to the Imperial Network then a computer virus could be implanted that would lead to critical system failure. Lastly Sir, and I encourage you not to take this course of action, is to undertake a suicide mission. By concealing an explosive device upon your person, you could then get captured and, when entering the ship's main control room, detonate said device. Hat tip to the academics of Heriot-Watt University, Edinburgh, who helped program T-3PO for these calculations.